Dan is crazy for fish tacos. He has tried them at pretty much every restaurant that serves them, and it has been his ongoing quest to find the very best fish tacos in Dallas. We had never made them at home, but after seeing a show with “Sam the Cooking Guy” preparing this recipe, we were inspired to try making our own. While I’ve never been a huge fan of fish in any form, I love these fish tacos, and they are now one of my favorite ways to eat fish. They don’t have any “fishy” taste at all — just very fresh, spicy, tangy and delicious. One of the key ingredients for these tacos is the chipotle sour cream sauce. It’s as simple as it sounds — a chipotle chile and sour cream. You should be able to find canned “chipotle chiles in adobo sauce” in the Hispanic foods section of your local grocery store. Take one of the chiles out of the can (or 2 if you dare — they are very spicy! ), then finely chop it. Add the chopped chile and about a teaspoon of the adobo sauce from the can (less if you like it more mild) to 2-3 tablespoons of sour cream. We use light sour cream because we really can’t tell a difference between it and regular, especially with the spicy chile added to it. Mix it all together and you have chipotle sour cream sauce to garnish the tacos. Any leftover sauce will keep in the refrigerator, covered, for about a week. The traditional garnish for fish tacos is cabbage, which makes no sense to me but is surprisingly good. We typically buy the pre-packaged (dry – no dressing) cole slaw because it’s easiest. Dan added about a teaspoon of red wine vinegar and some salt and pepper to the cabbage to give it a little more flavor. Next, prepare the seasoning for the fish, starting with a teaspoon of ground cumin. Then add a teaspoon of chili powder. Finally, add a generous pinch of salt and pepper and mix it all together. This spice rub adds a ton of flavor to the fish. Chop up an onion into 1 inch pieces to saute with the fish. For this and most of our fish recipes, we use frozen tilapia fillets. They keep indefinitely in the freezer and are easy to thaw by running cool water over them in the sink for only a few minutes. Prepare the fish by cutting each filet into 2 pieces and cutting out the dark middle part and discarding it (this removes the fishy taste). Dan says this step is optional, but apparently necessary when he cooks fish for me. Then cut the fish into one inch cubes. Season the fish with the spice rub. Mix up the fish and spices to make sure all the pieces are well-seasoned. Heat about a tablespoon of vegetable oil over medium-high heat, then add the onions. Saute the onions for about 3-5 minutes, until they get lighter in color and begin to soften. As the onions are cooking, prepare the tortillas. We use corn tortillas for these tacos. We like to heat the tortillas in a cast iron skillet for about a minute on each side, then put them in our tortilla warmer while we finish cooking. Add the fish to the onions and cook over medium-high heat for approximately 5 more minutes, or until the fish is cooked through. Place the fish and onions on a tortilla, then garnish with cole slaw, pico de gallo and chipotle sour cream sauce. The above picture is a sad representation of these delicious tacos — they taste so much better than they look. We highly recommend you try them, even if you don’t like fish! Plus, they are quick and easy to prepare, which makes them ideal for taco night during the week! Chop the onion into 1 inch pieces. 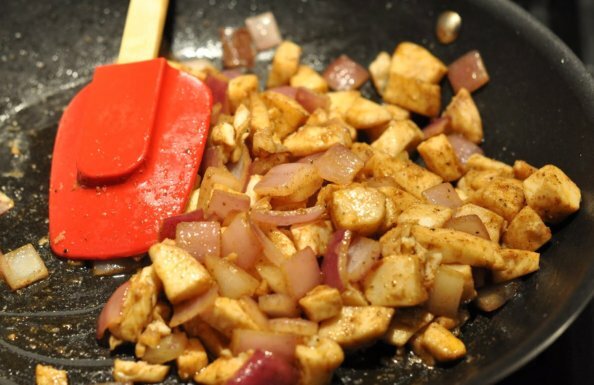 Heat a tablespoon of vegetable oil over medium-high heat and add the chopped onions. Saute the onions for 3-5 minutes, until they get lighter in color and begin to soften. Prepare the fish by cutting each filet in half and removing the brown middle part (if you like it less “fishy” tasting.) Then cut the fish into 1 inch cubes. Mix together the cumin and chili powder, then sprinkle it over the fish, tossing to make sure all the pieces are coated evenly. Add the fish to the sauteed onions and cook over medium-high heat for about 5 minutes, or until the fish is cooked through. To make the chipotle sour cream sauce, add 1 finely chopped chipotle chile and about a teaspoon of adobo sauce to 2-3 tablespoons of sour cream and mix together well. Serve the fish and onions on white corn tortillas (or flour if you prefer), garnished with cole slaw, pico de gallo and chipotle sour cream sauce. These tacos are so delicious. They are so fresh, light and not “fishy” at all! Thanks Robyn — so glad you like them!